As we get ready for the end of the year, it’s time to look back on 1962. What happened this year? Here’s a brief set of headlines from 1962. The electronics industry jumped to 5th place in product value of United States industries, even though most of products were sold to the US government: little consumer electronics at this point. 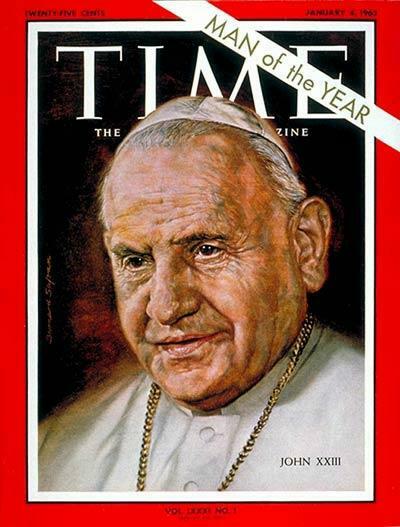 Time Magazine’s Man of the Year for 1962 was Pope John XXIII. The Pope convened an Ecumenical Council in October, after several years of preparation. It was the first since 1870 and one of only twenty-one during the entire history of the Catholic Church. Pope John XXIII has since been made a saint by the church. As one year ends, it’s time to celebrate the New Year…1962! Yes, 1962 starts all over again here at Roadtrip-’62 ™ ! We’ve got food, music, party decorations and lots more at our permanent New Year’s Party! Come join the fun! Start the New Year with a Roadtrip! The New Year is a good time to start a roadtrip. Why not join me at the Introduction to our roadtrip down highway US-23? We’ll be traveling through 1962 from Mackinaw City, Michigan to Jacksonville, Florida. Or, if you’d like a longer roadtrip, join me at the Introduction to our roadtrip down highway US-6. It’s over 3500 miles from Atlantic Ocean in Provincetown, Massachusetts to the Pacific Ocean in Long Beach, California. - January 1, 2015. Since our US-6 trip ends nearby in California, let’s see the Rose Bowl Game for the New Year! In the 1962 Rose Bowl Game, the Minnesota Golden Gophers defeated the UCLA Bruins, 21–3. The 2015 game features Oregon versus Florida State. Speaking of the World’s Fair in Seattle, you can watch some of the advertising. Almost makes you want to go back in time to see it! Buy some great music from 1962!